Talk about fun food for kids!! This cute owl pancake breakfast has to be one of my favorite plates that Jill has ever made. My daughter is in love with owls and this would be a fun birthday breakfast to make for her, although I think she would want more than one piece of bacon, so the branch might need to be bigger. 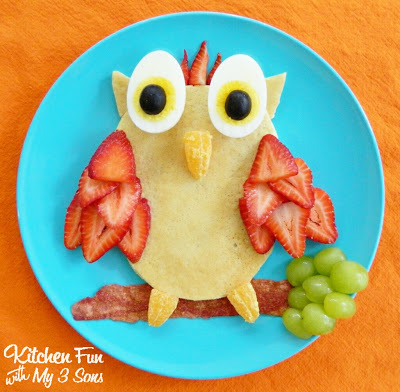 You can check out the owl pancake and all the other fun meal ideas over at Kitchen Fun with My 3 Sons.